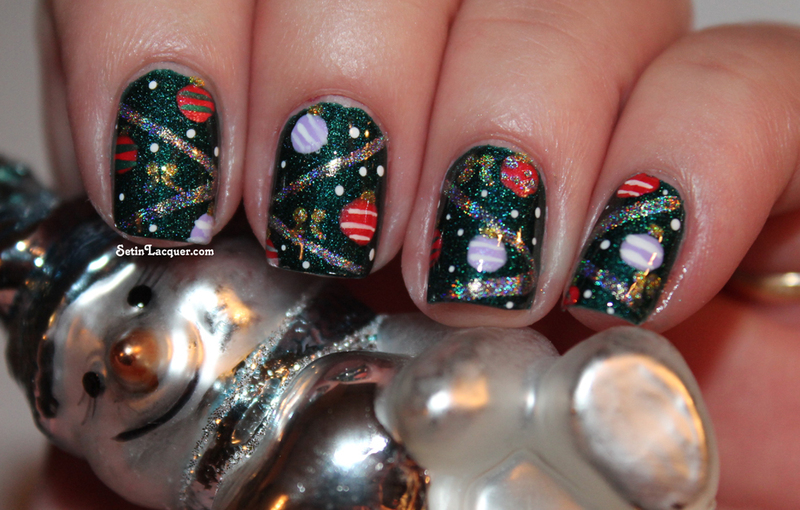 Today's post features some fun festive nail art. 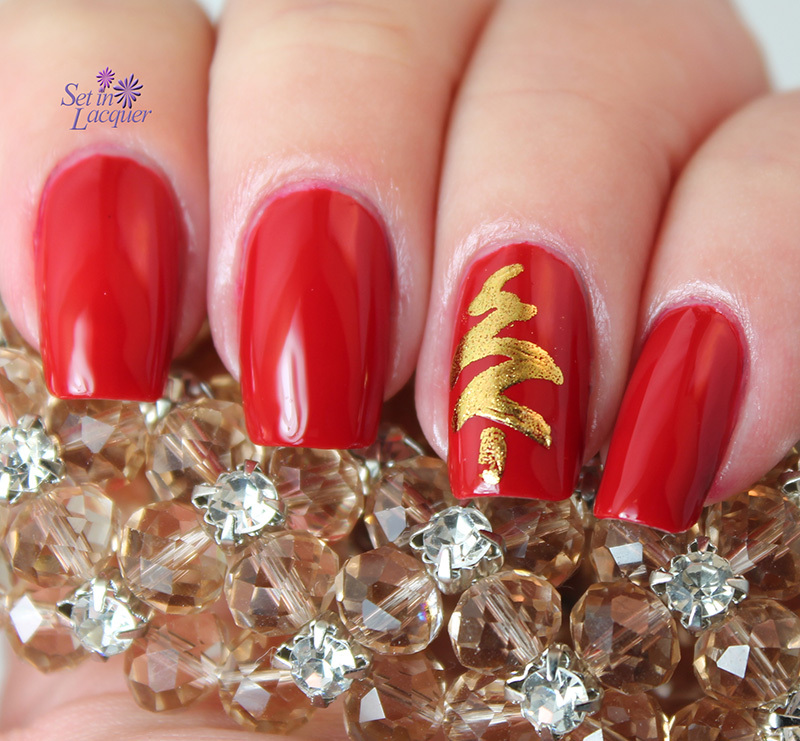 Santa's red suit provides some wonderful inspiration for manicures. 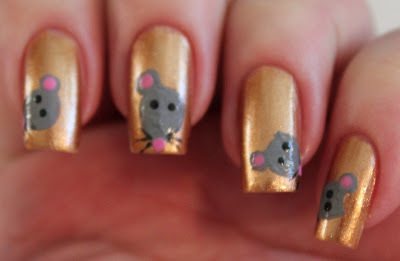 This nail art was easy to create. I started off with a coat of Zoya Elisa. 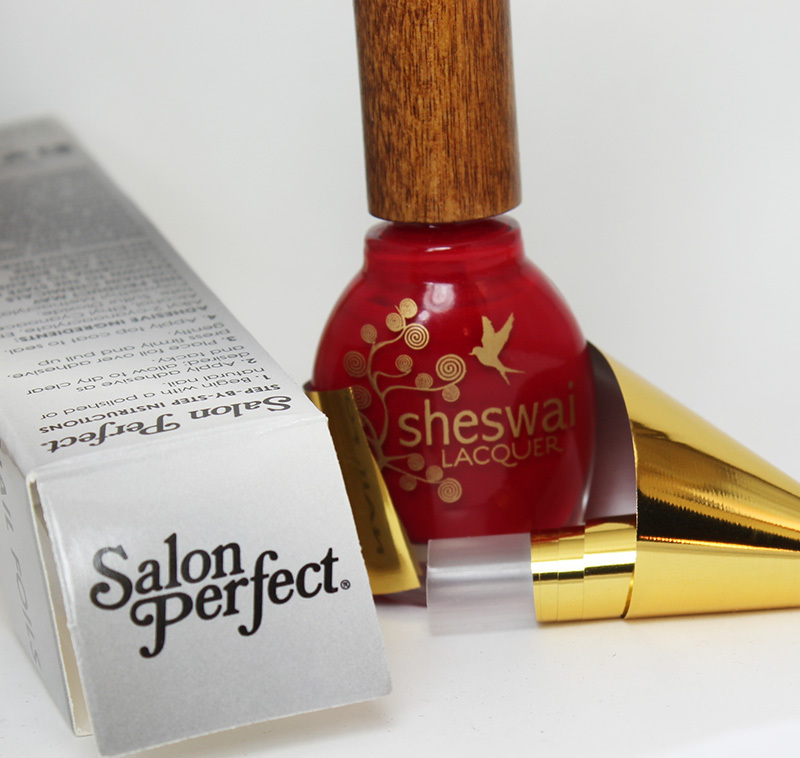 This perfect shimmery red is perfect for the base color. 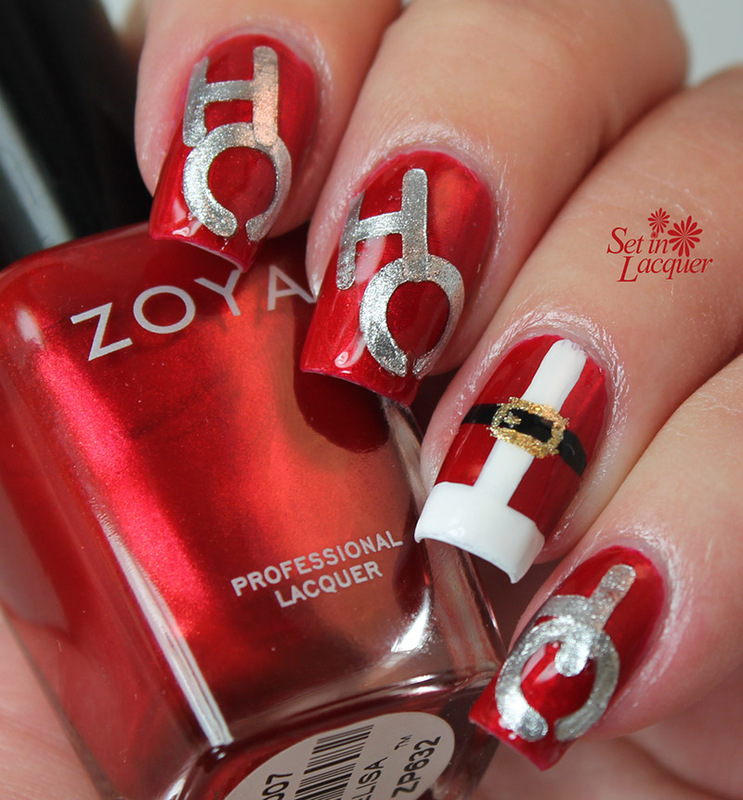 Then on my ring finger I used Zoya Purity for the white fur, Zoya Willa for the black belt and Zoya Ziv for the gold belt buckle. Then using craft punches (I found the set on a local garage sale website) I created the Hs and Os for the Ho Ho Ho. I used Zoya Trixie for this. It is easy to use punches for DIY decals. I applied a thin coat of clear coat to a plastic lid and waited for it to dry. Then I applied a thin coat of Trixie. Once it was completely dry, I peeled it off and punched out the letters. The letters are applied to the nail over a still wet clear coat and then pressed down. I used two coats of HK Girl to protect the design and smooth out the decals. Have you tried making your own decals? Share your tips! These polishes were previously sent to me for review. All opinions are my own. Please note that computer monitors may display colors differently. 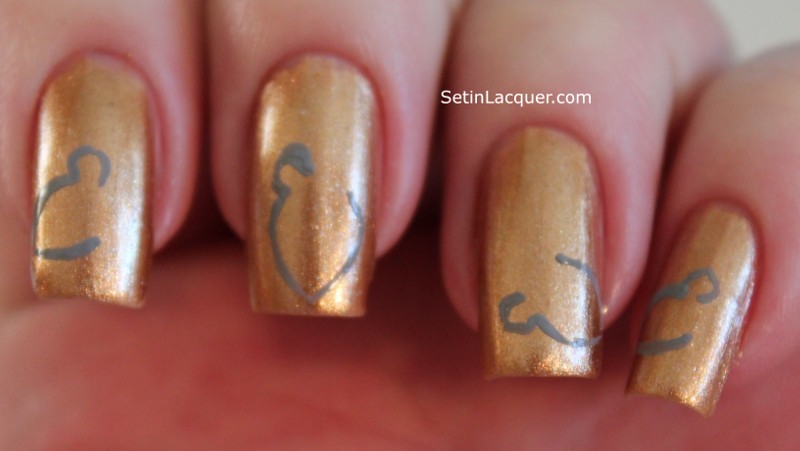 I have some fun patterned nail art for you today. 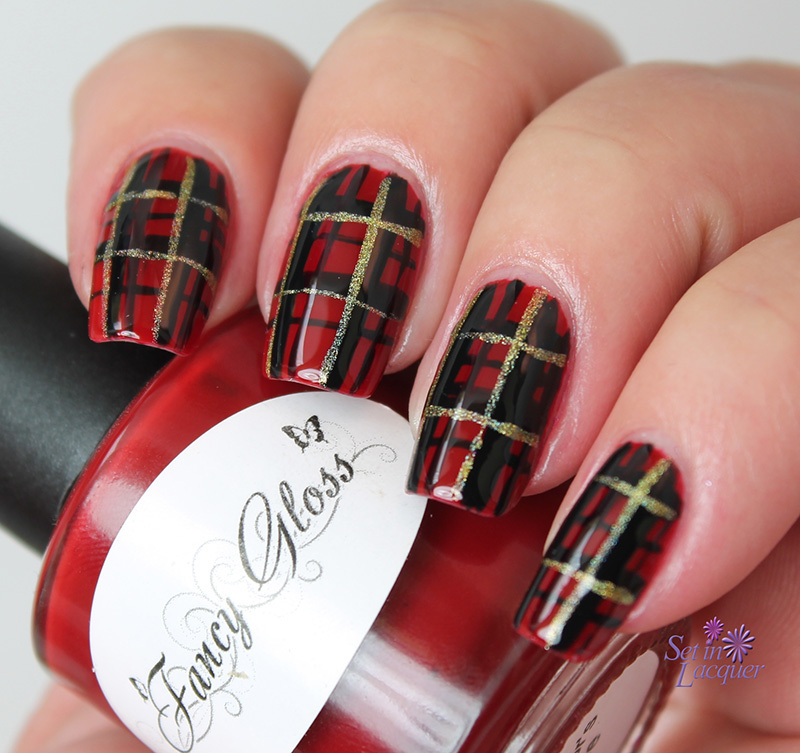 It's a saucy plaid and it's perfect for the holidays or any day. Change up the colors or the amount of stripes if you want a completely different look. I completely enjoy creating nail art. I completely focus on the task at hand and forget everything else. 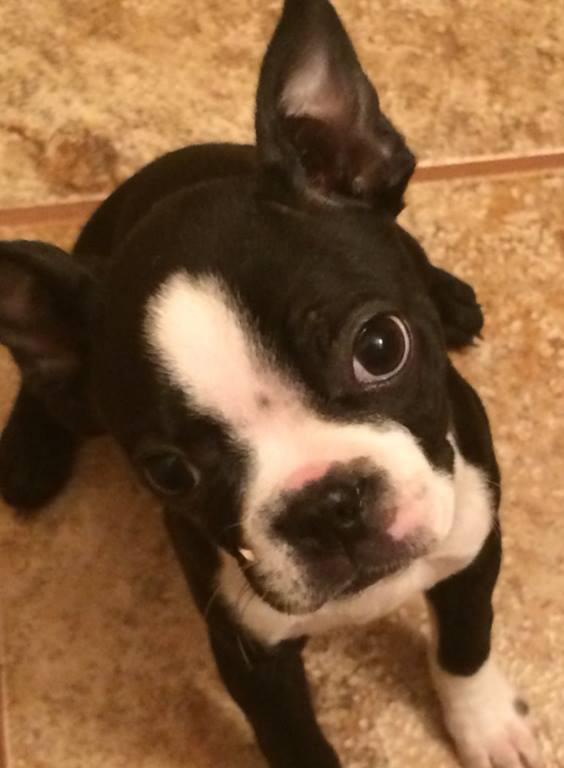 Which isn't the best thing when you are trying to potty train a puppy. Yes, there is a new critter at the Set in Lacquer household - meet "Cricket." That sweet little innocent face manages to keep me hopping! But I digress, back to the nail art. 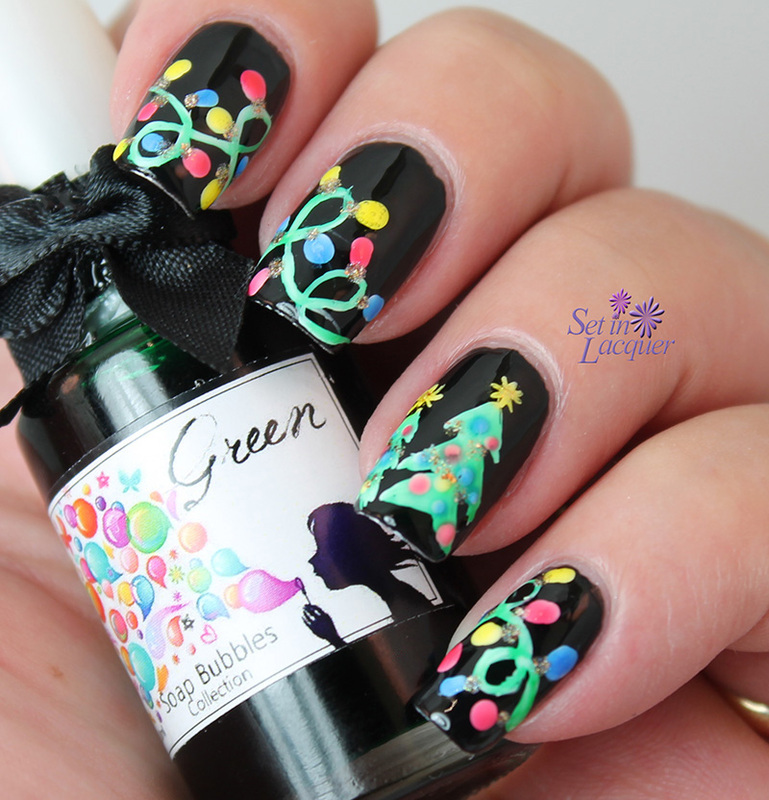 I love patterned nail art - argyles, plaids, stripes, dots... the possibilities are endless. But this time I knew I wanted a red plaid with small gold stripes in it. So I set to work. I used Fancy Gloss "A Sailor's Love," Zoya "Willa" and Colors by llarowe the gold from the "Silver and Gold" duo. 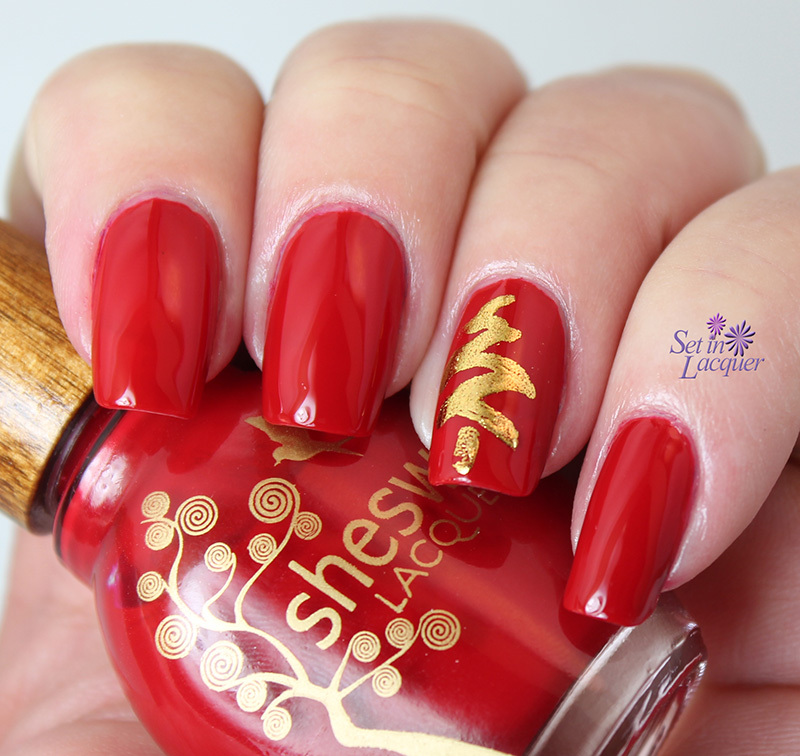 Two coats of A Sailor's Love provided the rich red base. Then I used a striping brush and added black stripes with Willa. 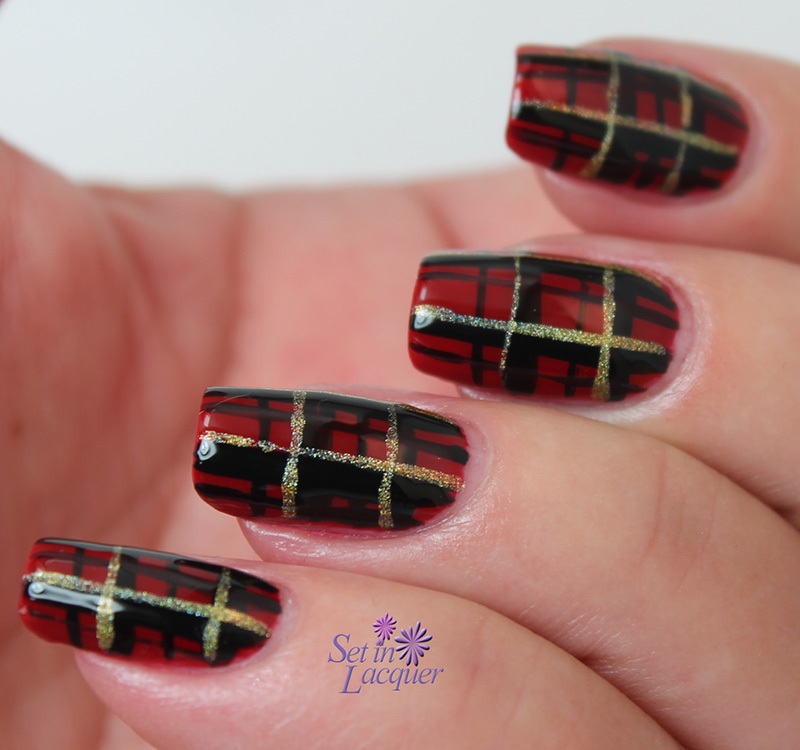 Small stripes of the gold polish gave this plaid nail art the festive appearance I was striving to achieve. I topped it off with a top coat of HK Girl to seal off the design and to provide a high-gloss finish. What do you think about this festive plaid? Patterns are timeless. Theses polishes were previously sent to me for an honest review. All opinions are my own. Please note that computer monitors may display colors differently. I have a love/hate relationship with nail art foil. I love it, and it usually hates me. However, I had an idea and I just had to try it. 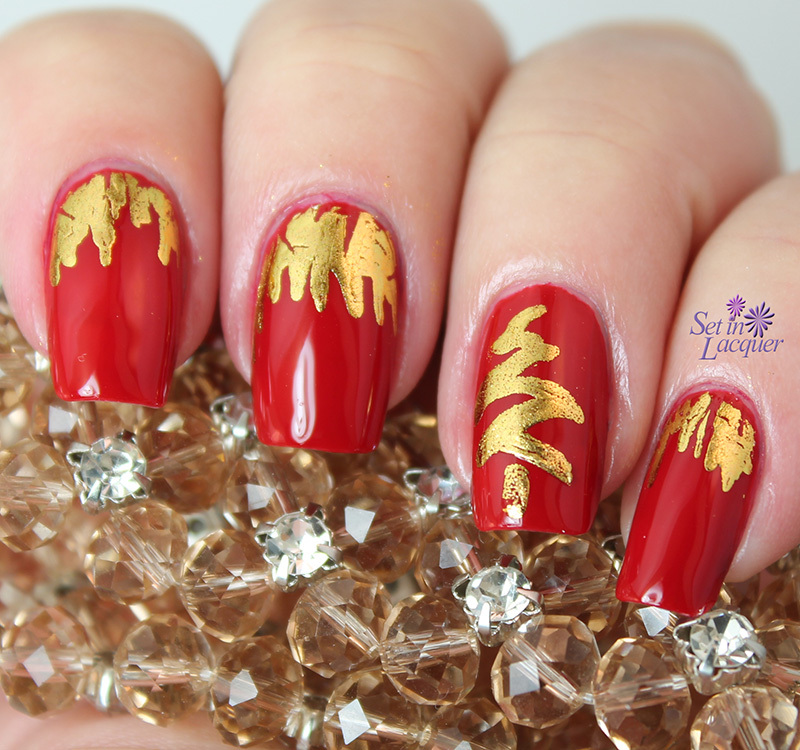 I decided to create a simple, abstract gold Christmas tree over a deep red polish. I am oh-so-pleased with the results! I started out with two coats of Sheswai Honeyfox. It is the perfect shade of red - at least I think so. Then I used a nail foil glue and painted a swishy line back and forth. (Yes, that's a technical term.) The glue I used is the kind that dries clear and stays tacky. I let it dry until completely clear and pressed a small piece of Salon Perfect Nail Foils to the nail. I rubbed my finger over the top to make sure it was adhered to the nail well. I peeled off the foil and peeked (I was afraid to look.) But it worked well! Then I decided I couldn't leave well enough alone and tried to add "icicles." I like it much better without the icicles. What do you think? This was so easy and the end result is simple and elegant. These items were previously sent to me for an honest review. All opinions are my own. Please note that computer monitors can display colors differently. 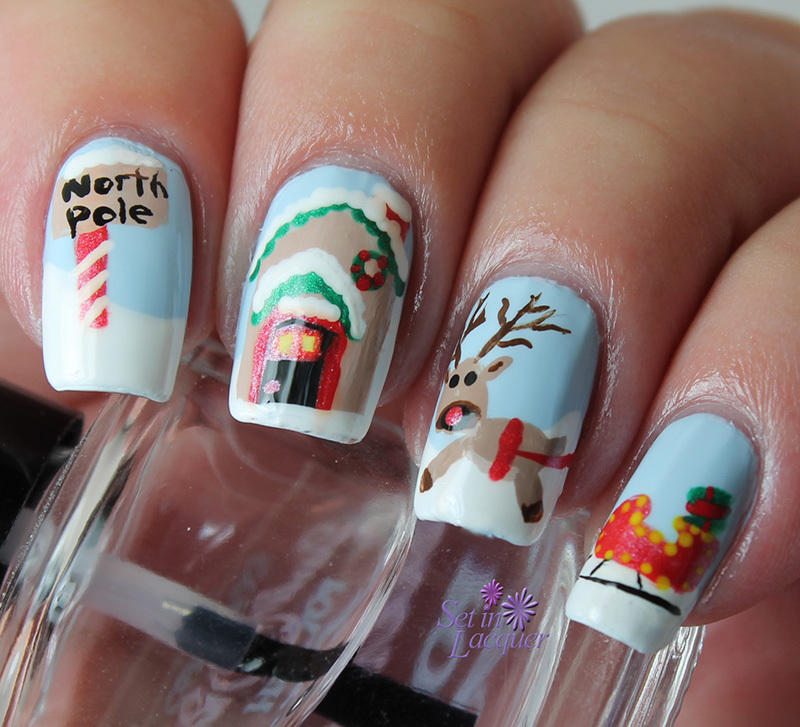 It's a week of holiday nail art. Well, at least it seems that way. I love this time of year. The crisp winter air and the seasonal lights and decorations always seem to revitalize me. Although - ask me in January how I feel about the "crisp winter air" and you will likely get a different answer. I love creating nail art and the winter weather and holiday season provide a lot of inspiration. So today I have two adorable little lovebirds in a wintery setting. I used Zoya Rocky for the base color. 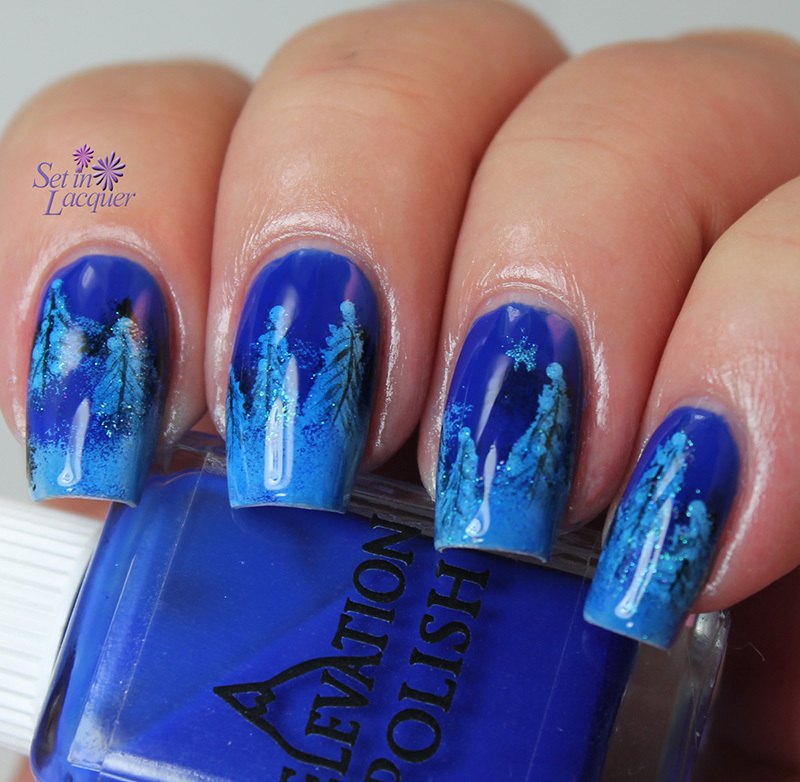 It's the perfect base color for this nail art. 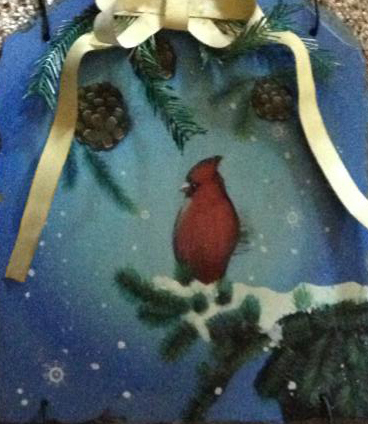 Then I used acrylic paint and added the tree branches and birds. I also added a few snowflakes afterward because it just seemed to need something. I love the end result. 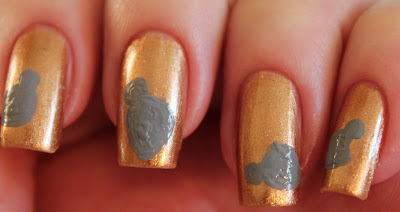 I added a top coat of HK Girl to seal in the design. This Zoya nail polish was previously sent to me for an honest review. All opinions are my own. Please note that computer monitors may display colors differently. Well, for those of us that celebrate Thanksgiving, it's over for another year. 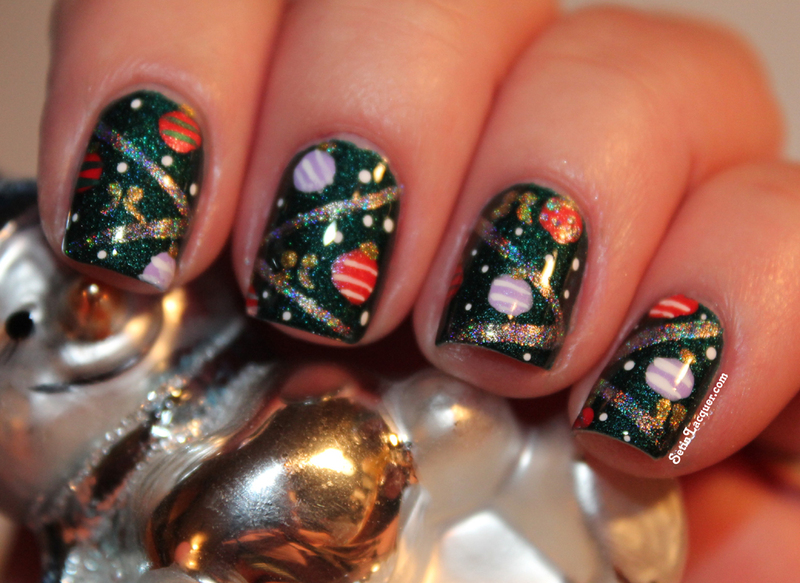 So of course I had to create some holiday nail art. I had a concept in my mind and went for it. It worked out for the most part... My reindeer looks a little silly. But hey, aren't all reindeer silly? I used Zoya Purity and Blu for the base colors. The light blue and white worked well for the sky and snow. The design was created using acrylic paints. I love using acrylic paints for nail art. If you use a good top coat before you use the paint it is easy to "erase" mistakes with a wet cotton ball or Qtip. 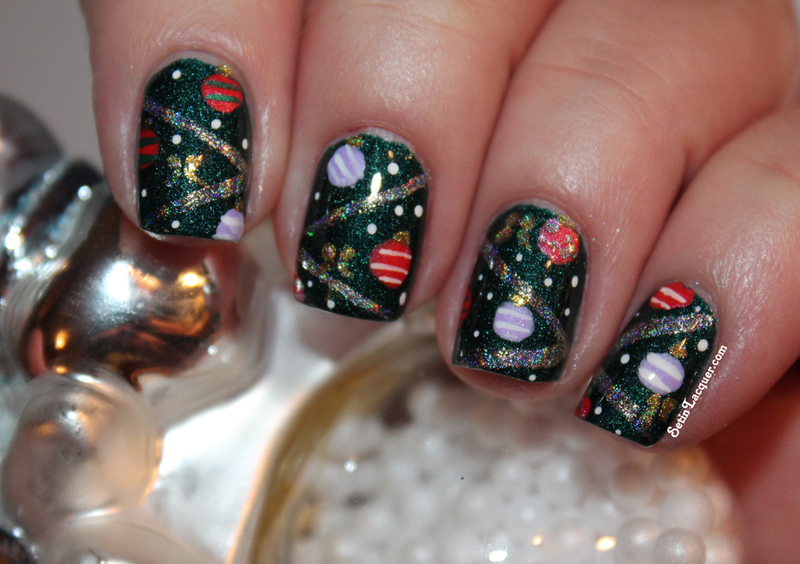 Are you going to be creating any holiday nail art? Red, green, gold and silver are such festive colors. 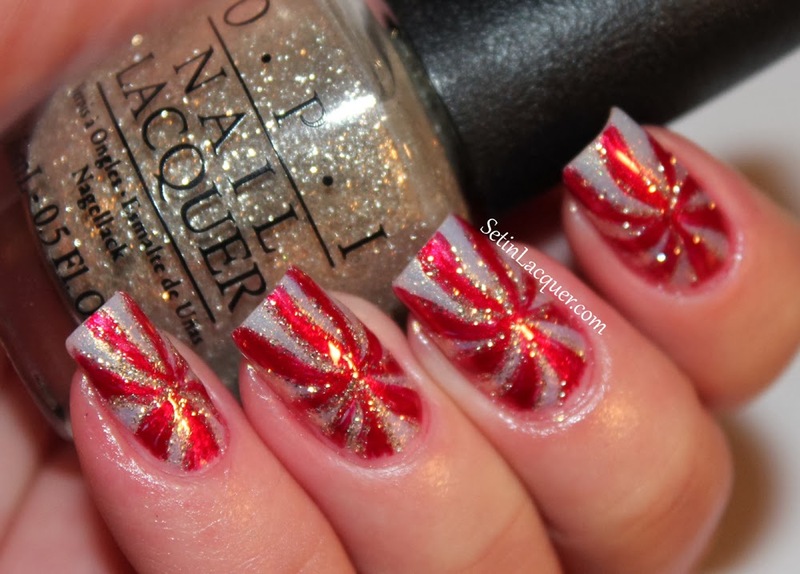 Add a little sparkle and glitter and you have an instant holiday mani. 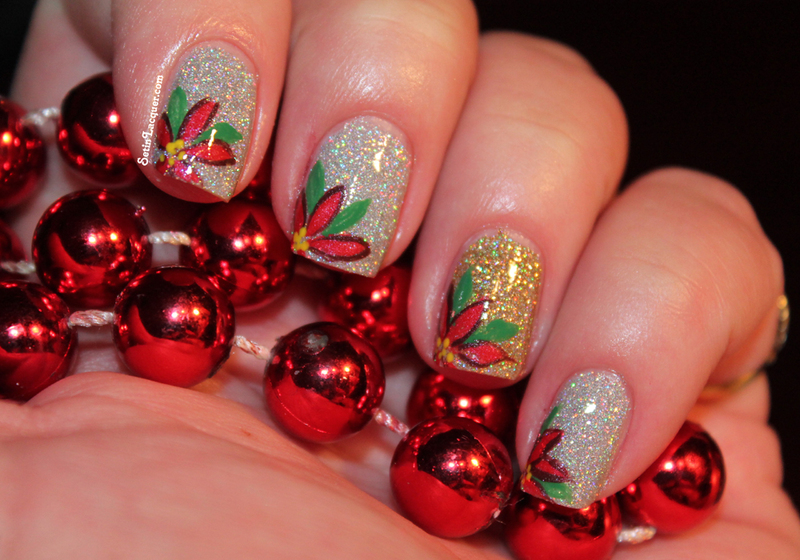 I used China Glaze Glistening Snow and Angel Wings for the base colors. Glistening Snow is a gorgeous silver holographic glitter and Angel Wings is an astonishing gold holographic glitter polish. For the poinsettia I used acrylic paints. These polishes were previously sent to me for an honest review. All opinions are my own. Please note computer monitors may vary in color display. I was browsing on Pinterest the other day and saw a mani that I just had to try. It was a close up view of a Christmas Tree. Nails in Nippon did a wonderful job on these and I just had to try her technique. So I gathered my polishes and tools and set to work. I started off with a base color of A England - Saint George. It's a gorgeous shimmery pine green shade with a touch of holographics thrown in. 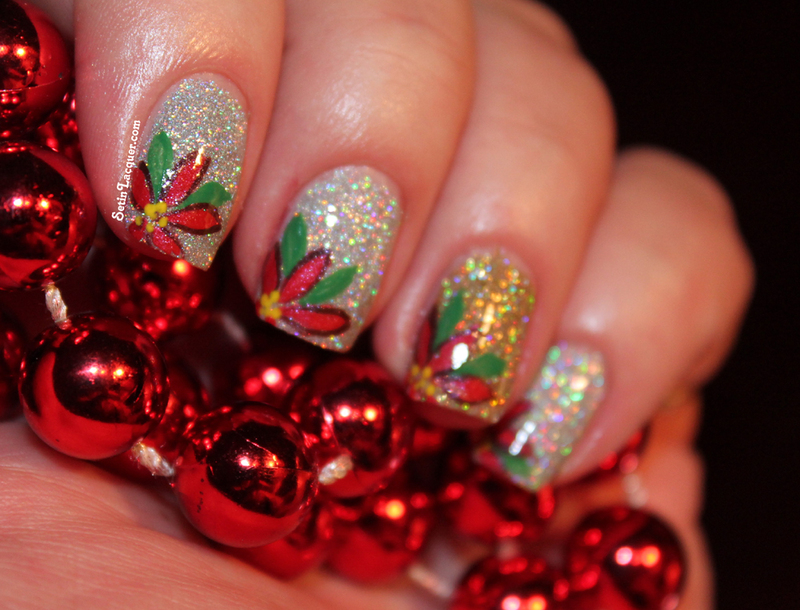 Then I added the garland with the Silver from Colors by Llarowe Silver and Gold duo. For the hangers on the ornaments and the bows I used the Gold from Colors by Llarowe Silver and Gold duo. The rest of the colors were all from acrylic paint. It has such amazing detail. I love it. My nails are slowly but surely starting to grow back after the deep breaks I had a couple of weeks ago. 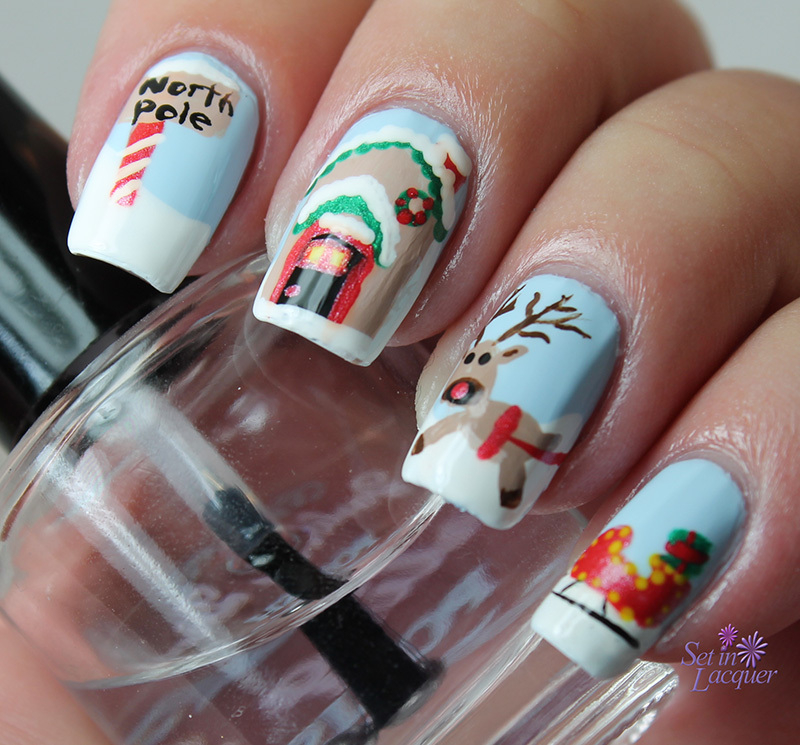 What are you going to have on your nails to show the holiday spirit? Some of these polishes were previously sent to me for an honest review. and some were purchased by me. All opinions are my own. Due to differences in computer monitors the colors you see may be slightly different from the actual color. Time's been flying and around here in Wyoming the snowflakes have been flying too! So I decided I just needed to accept those little unique miracles of nature and deal with it. So I created some glitzy snowflake nail art. I started off with a base color of Barielle Lyndsay's Dancin', which is a gorgeous shimmery true red. It's definitely a great color for the holidays. Then I added Barielle Gold Digger in a gradient on the tips. I used a cosmetic sponge to dab and blend the colors. 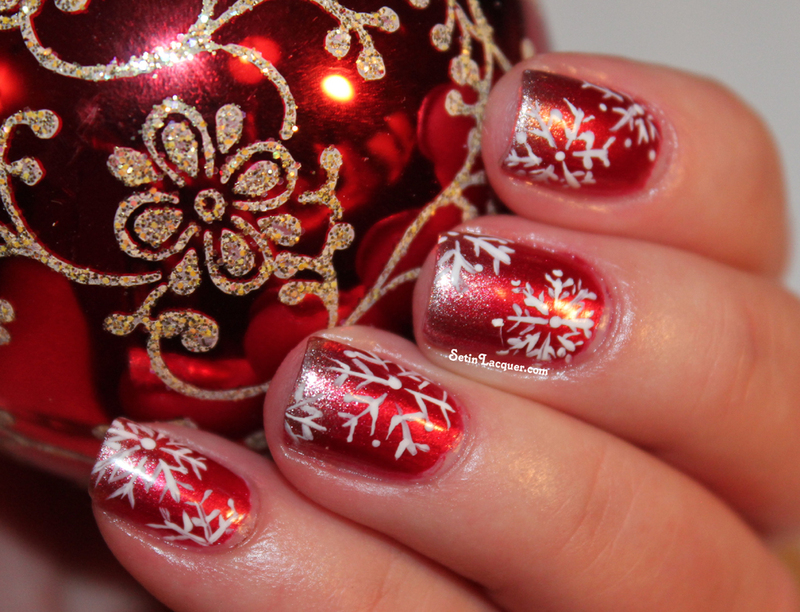 I used a thin striping brush to create the snowflakes with Barielle Young 'N in Love. Its a perfect white which dries fast and makes wispy snowflakes. I topped it off with a top coat of Seche Vite to protect the nail art and provide some serious shine. 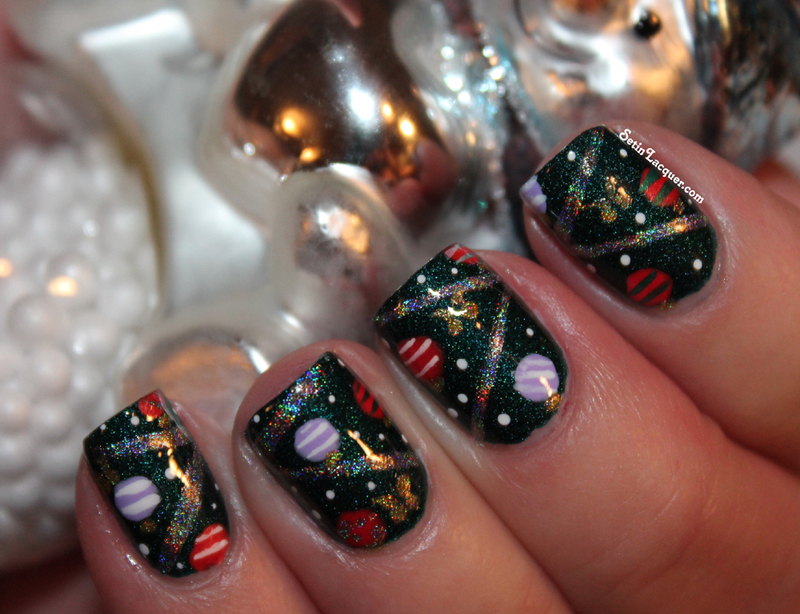 What's on your nails for the holidays? These polishes were previously sent to me for an honest review. All opinions are my own. Due to differences in computer monitors the colors you see may be slightly different from the actual color. 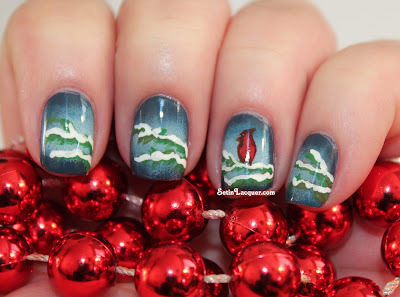 Did you know if you aren't in the holiday spirit that creating some holiday nail art can help? 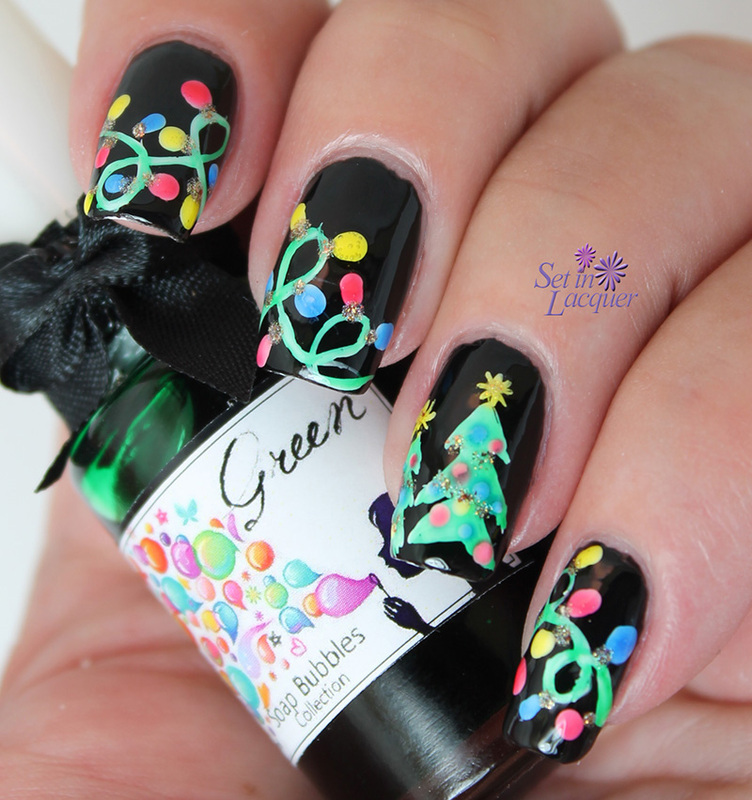 That a little bit of festive polish and paint can prime you right into singing carols. It's a good thing no one can hear me right now! Fa la la la la la la la la. I was visiting a friend and saw a wooden plaque hanging on her wall. The Cardinal practically jumped off its snowy perch and screamed at me to try and recreate him. So I did! Here's the wall hanging that gave me my inspiration. And here's the attempt at recreating it. I started off with a base coat of Zoya Natty. There is just something about that deep dusty blue that I just love. Then I used Zoya Breezi and Blu in a gradient that faded out from the center. For the actual tree branches, snow and the Cardinal I used acrylic paint. I love this mani. I haven't had much time to do nail art lately and it is something I simply love to do. These polishes were previously sent to me for review. All opinions are my own. Please note computer monitors may vary in color display. Zoya has done it again. The Dream Boxes are being released. I purchased one of these last year for my niece. The packaging is amazing and the contents are a dream! Thanksgiving night and Black Friday only there is a special deal! 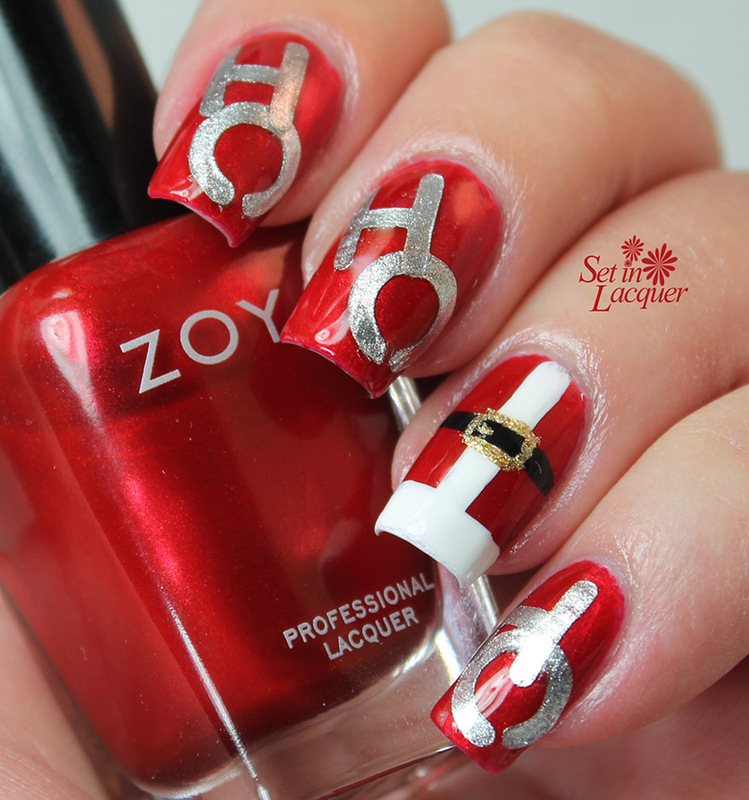 Includes 12 piece Zoya “Cheers to All” Gift Box (above), Zoya Color Lock Mini and FREE SHIPPING. More than a $118 Value. Valid 6 p.m. EST Nov. 28, 2013 until Nov. 29, 2013 11:59 p.m. EST. only. Nail Polish Dreaming reaches new heights this holiday season with the release of Zoya Dream Boxes, curated nail polish color combinations delivered in deluxe black gift boxes of three and six or simply order a box and fill ‘em up yourself, with more than 300 gorgeous hues, the possibilities are almost endless. Pssssst.... they make a gorgeous gift when stacked tall too! Supplies are very limited - Order early! Find the deals on the Zoya.com website! 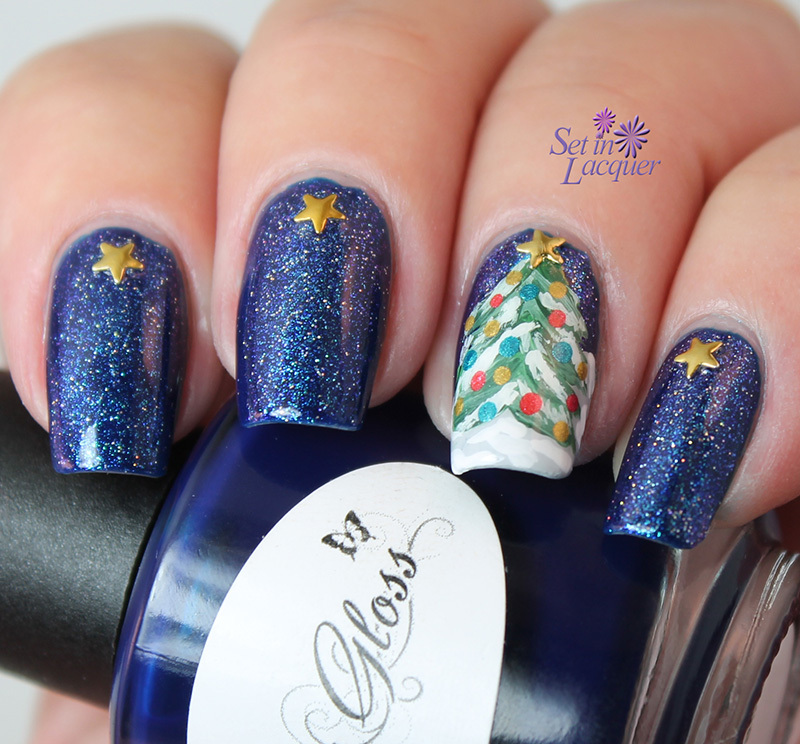 ZPDRMBX1301 - Tinsel Time: includes Zoya Ziv, Storm and Trixie. $24 (US). ZPDRMBX1302 - Glittering Gift: includes Zoya Storm, Payton and Blaze. $24 (US). ZPDRMBX1303 - Fireside Chic: includes Zoya Black Swan, Casey and Sam. $24 (US). ZPDRMBX1304 - Oh What Fun: includes Zoya Aurora, Dream and Logan. $24 (US). ZPDRMBX1305 - Roasty Toasty: includes Zoya Lael, Timo and Envy. $24 (US). ZPDRMBX1306 - Warm Wishes: includes Zoya Maria Luisa, Sarah and Asia. $24 (US). ZPDRMBX1307 - Merry and Bright: includes Zoya Alegra, Ivanka and Charla. $24 (US). ZPDRMBX1308 - Ice is Nice: includes Zoya Ziv, FeiFei and Daul. $24 (US). Shown Left. ZPDRMBX1309 - Rosey Cheeks: includes Zoya Kerry, Tinsley and Bobbi. $24 (US). ZPDRMBX1310 - Cozy Cashmere: includes Zoya Nyx, Vespa and Godiva. $24 (US). ZPDRMBX1311 - Starry Night: includes Zoya Tomoko, Dahlia and London. $24 (US). ZPDRMBX1312 - Sparkling Lights: includes Zoya Carter, Sunshine and Arabella. $24 (US). ZPDRMBX1313 - Keep it Cozy: includes Zoya Flynn, Hunter, Livingston, Mason, Neve and Channing. $48 (US). ZPDRMBX1314 - Sugar Rush: includes Zoya Tomoko, Dahlia, Chyna, Arabella, Carter and Sunshine. $48 (US). 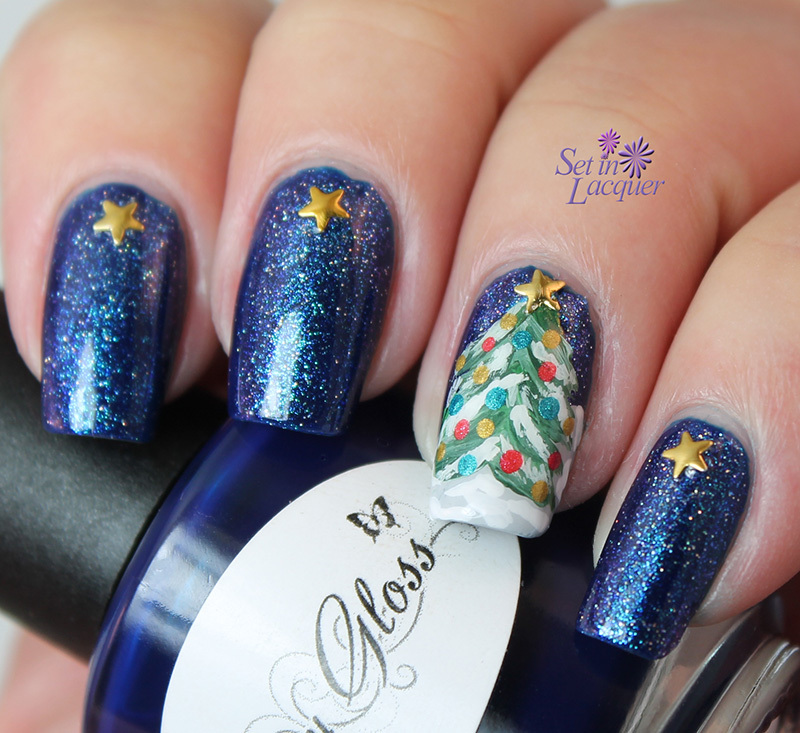 ZPDRMBX1316 - Festive Favorites: includes Zoya Maria Luisa, Storm, Kissy, Blaze, Aurora and Mosheen. $48 (US). ZPBLBOX03 - Build Your Own Box - Trio (3): Order the box and fill it up with three of your own polish picks. $24 (US). ZPBLBOX04 - Build Your Own Box - Six (6) Pack: Order the box and fill it up with six of your own polish picks. $48 (US). I love creating holiday nail art and Halloween is always a fun inspiration. There are a lot of creative designs to choose from - spiders, bats, witches, pumpkins... The list can be as long as your imagination allows it to be. 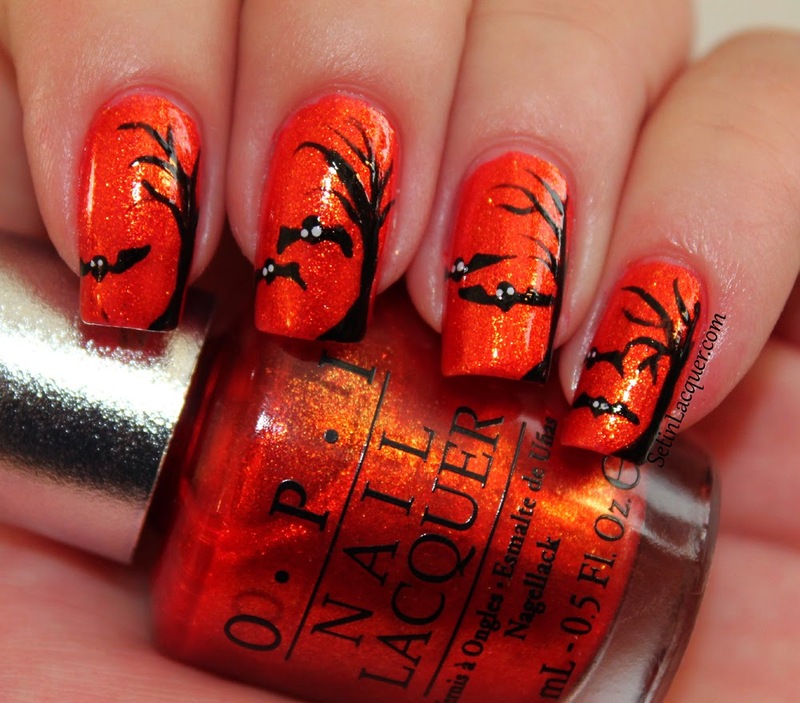 I wanted some spooky trees and flying bats so I tried to recreate that on my nails. I used OPI DS Luxurious for the base. 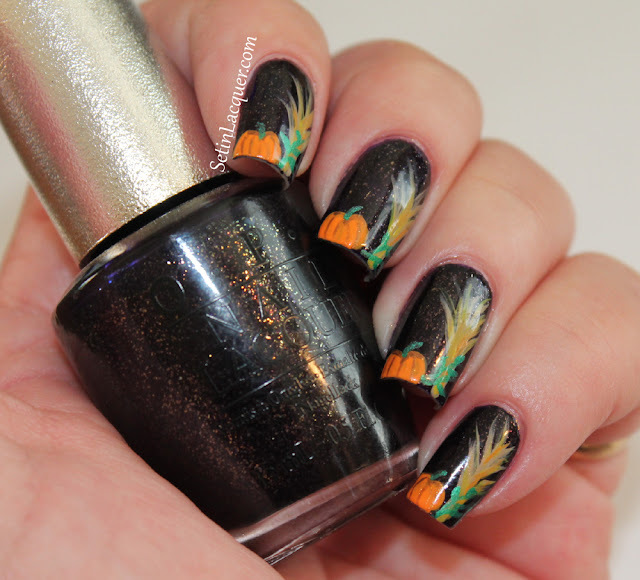 It's the perfect Halloween orange with a lot of shimmer and shine. I used black shimmery acrylic paint for the trees and bats. I have said it many times before but I positively love using acrylic paint for nail art. Then I used white paint and dotted the eyes. I like how it came out. The trees were really easy. You don't have to worry about perfect lines. Just use a striping brush for the branches. What are you putting on your nails? The polish in this post was purchased by me. 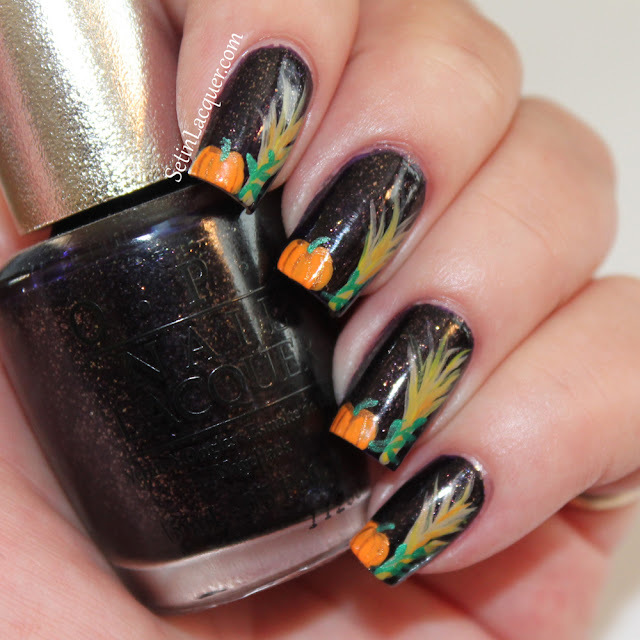 Halloween is just around the corner and I love all holiday nail art. I wanted something dark, yet not spooky or creepy. So I decided to go with a base color of OPI DS Mystery. It is a deep purple that is almost black. It has micro gold sparkle and it turned out to be a great choice as the canvas for the nail art. I wanted cornstalks and a pumpkin. So I grabbed my acrylic paints and MASH nail art brushes. I love these brushes. I have had them for quite a while and they get used a lot - but they are holding up quite well. I used tan, yellow and orange paint for the cornstalks. A few swipes of the brush with the different color paint added detail and dimension. Then using orange paint I added the pumpkins. A green stem on the pumpkin and all was complete - well almost. I didn't like how the cornstalks looked bare at the bottom. So I used green paint and added a few vines. What do you think? 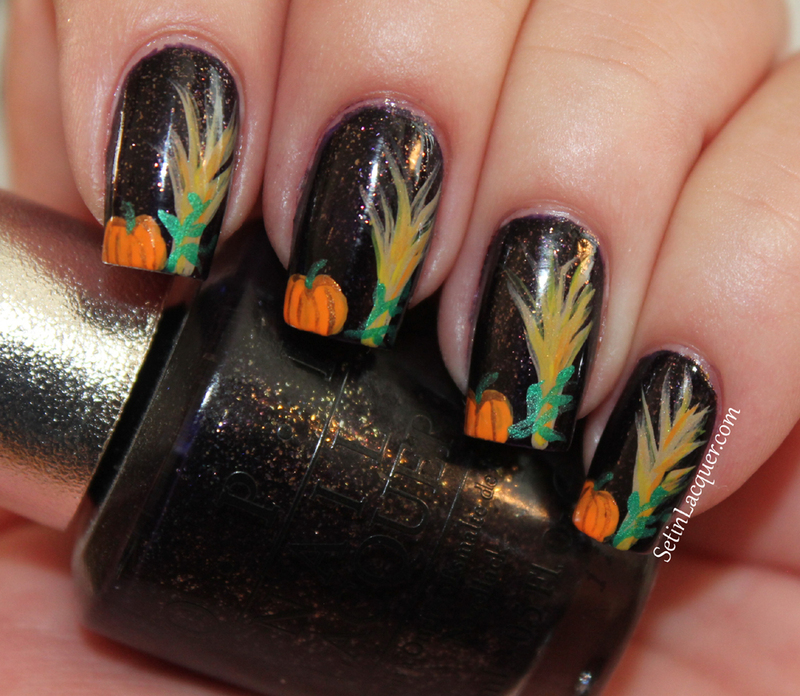 What's going to be on your nails for Halloween? 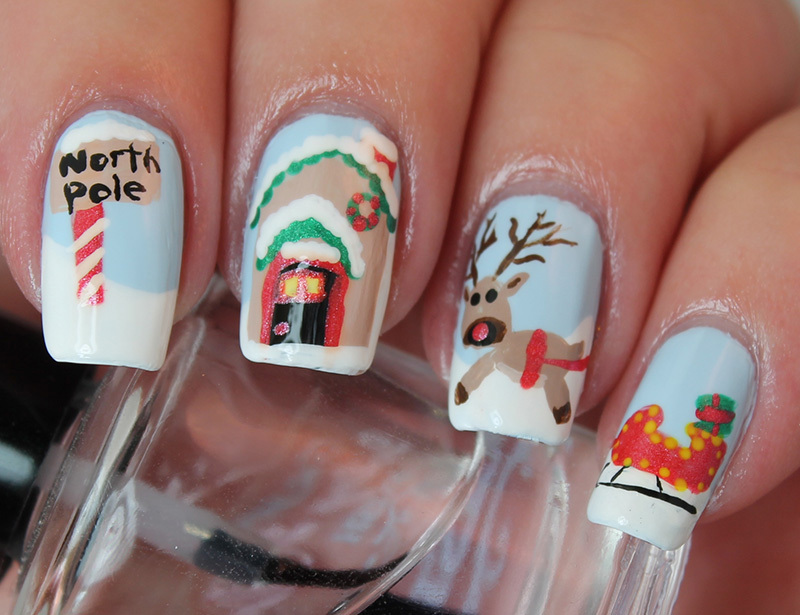 I love holiday nail art. Halloween is no different and it allows for so much creativity. I wanted something glitzy - yet in the spirit of Halloween it had to have a little bit of creepiness to it. 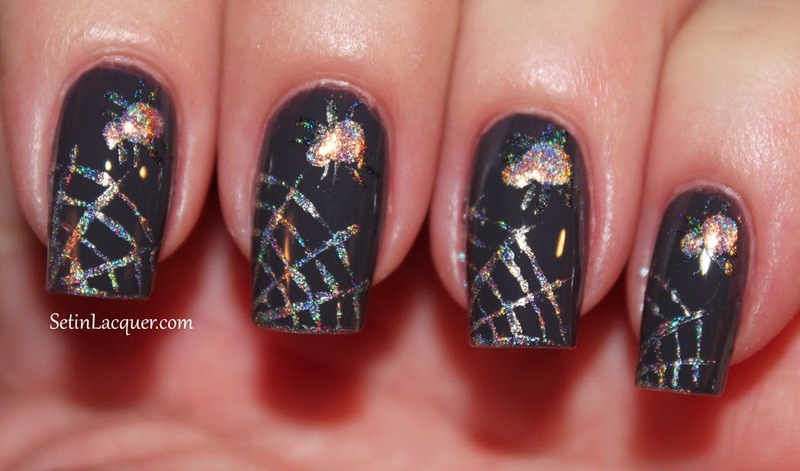 So how about a holographic spider web on your nails? I want to show you step by step how I did this and then you have the option to change it up if you want. I used Color Club Rad Nomad for a base color. 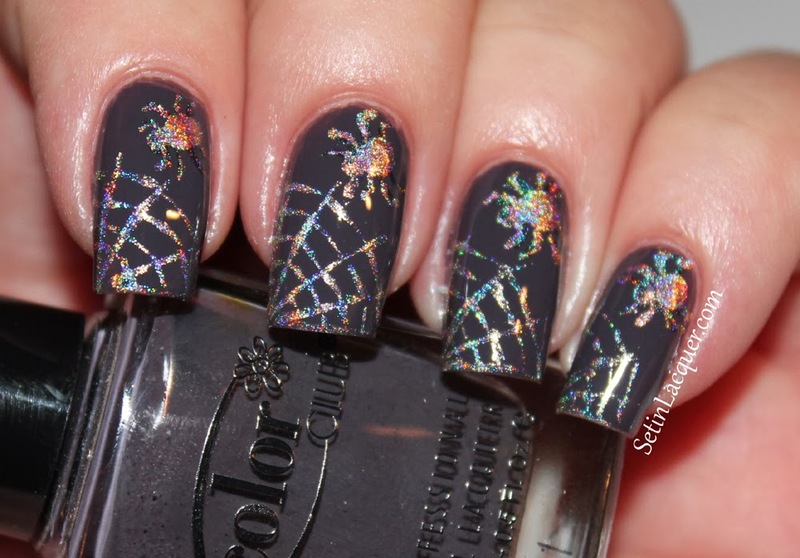 It is a deep, dark gray shade that works quite as a canvas for this nail art. Step one: apply the base color. Then using a striping brush and Color Club Harp On It I added diagonal lines from the corner of my nail. Harp On It is an amazing silver holographic polish. Step two: add diagonal lines from corner of the nail. Then I continued with Harp on it and painted the radiating lines of the spiderweb. I almost left it just like this I liked it so much! Step three - paint connecting lines. Then I used a dotting tool and dotted a large dot for the spider's body and a smaller one for the head. I used Color Club Cosmic Fate. You can see that I actually started by using the black holographic Color Club polish Beyond. But there just wasn't enough contrast for it to show well. So I dotted over it with Cosmic Fate. Step four - make a large dot for the spider's body and a smaller one for the head. Then I added the legs. Okay, I admit my spider looks a little squished. But I have to say that is exactly how I like any spider that is around me to be - squished. I am not a fan of spiders! 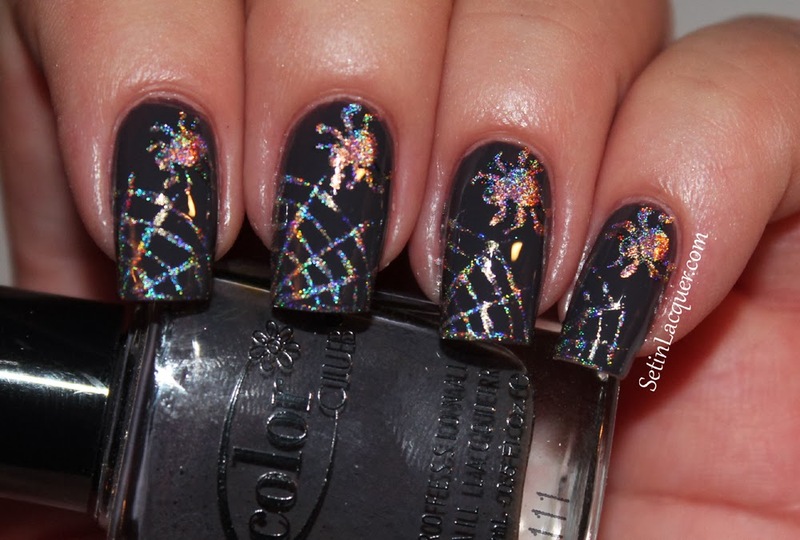 I added a top coat of Seche Vite and I had a sparkling spiderweb on my nails! I love the way the holographic web shines. What's going to be on your nails for Halloween? Are you going to include a holographic element? The polishes in this post were purchased by me. 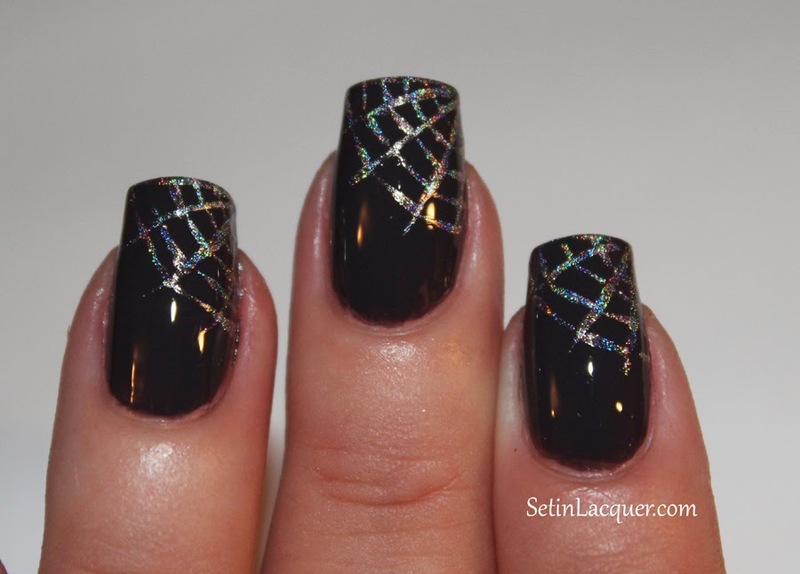 This weekend I spent a lot of time swatching the OPI Mariah Carey Holiday 2013 collection. 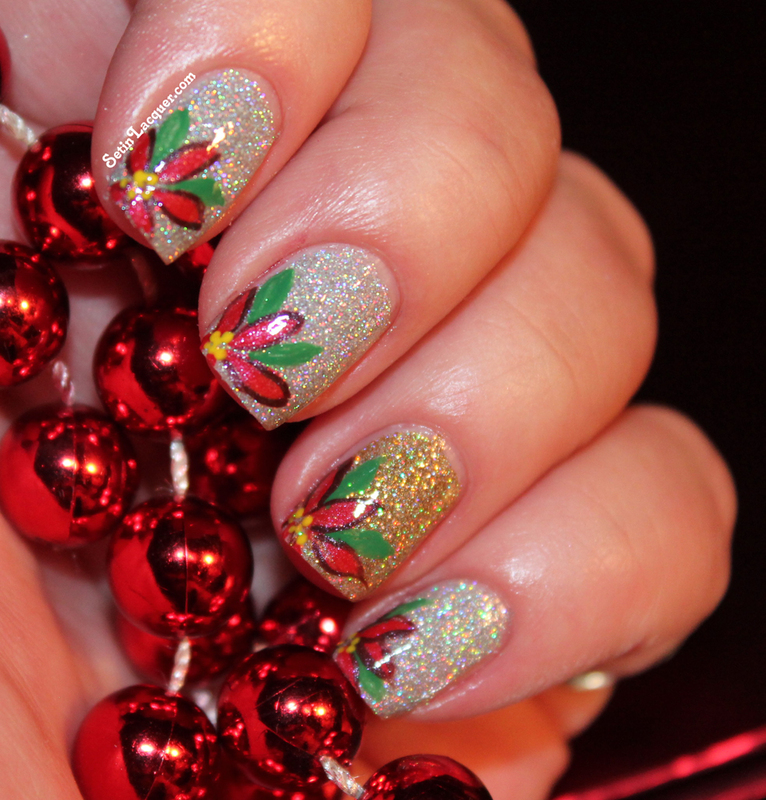 After spending time with polishes named "Under the Mistletoe," "In My Santa Suit," and "All I Want For Christmas" I was in the holiday spirit and had to create some holiday-themed nail art. I decided to go with a peppermint candy mani. I started with a base coat of Ski Slope Sweetie. Once that was dry I applied a small dot of In My Santa Suit to the center of each nail. I did that to give me a point of reference. Then using a nail art brush I drew swirly stripes radiating out from the center. Pretty easy so far right? Yep! I have some cute little critters to share with you today. These little Christmas mice are popping up everywhere. I intentionally made them facing different directions so it would look like they were peeking. 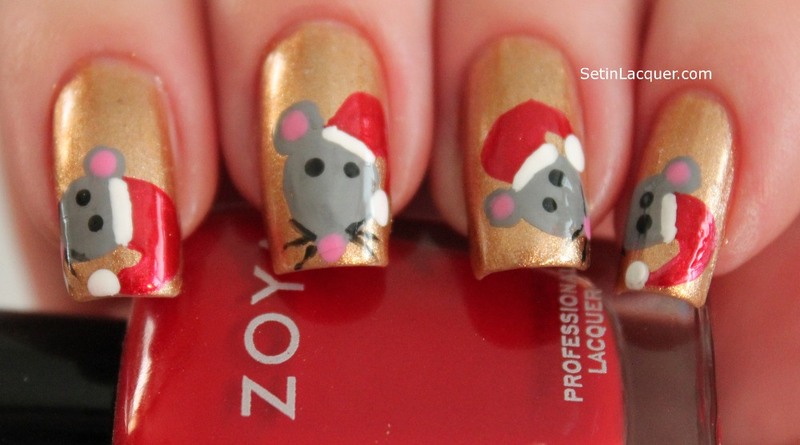 I used Zoya nail polishes for these little guys. I like Zoya for nail art - and it helps that I have plenty of them so I usually have all the colors I need. 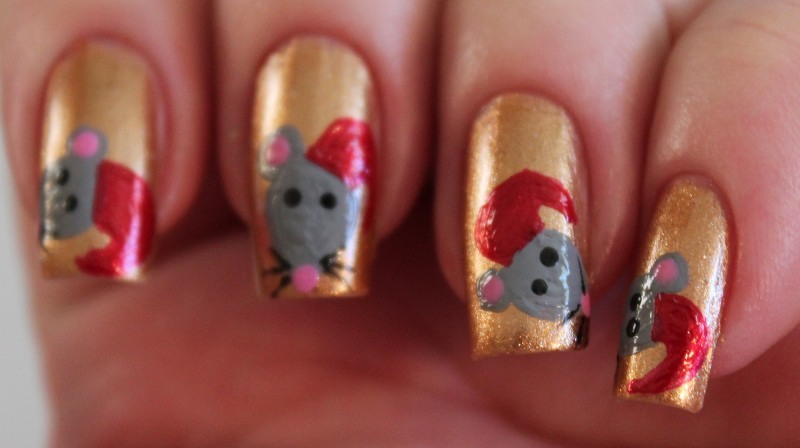 If I had to change one thing about these mice it would be to make their eyes a little lower on their face. But I am still pretty pleased with how they came out. Step two - fill in the outline with the gray. Step three, four and five - I used a dotting tool and Zoya Raven for the eyes. Then I dotted Zoya Shelby for the nose and the pink in the ear. 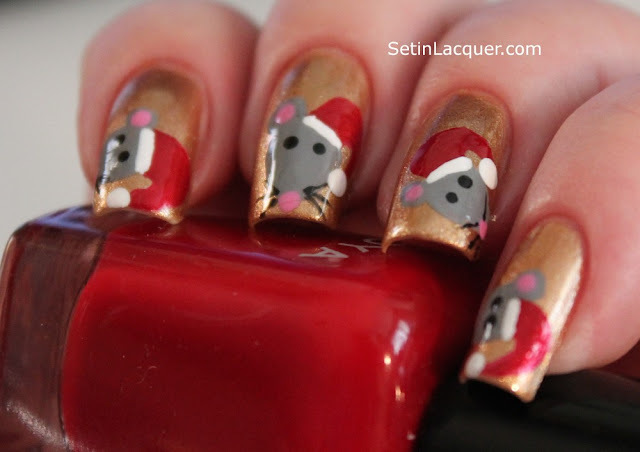 I also used a nail art brush and applied the whiskers. 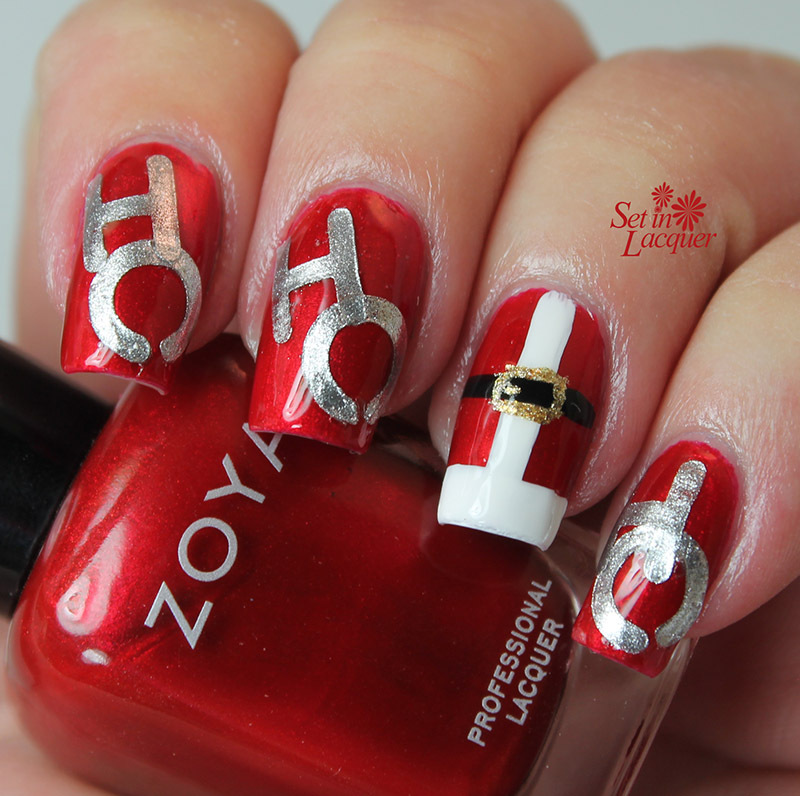 Step six - I used Zoya Eliza and a nail art brush to make the red in the hat. Step 7 - I dotted on the pom pom with Zoya Purity and striped on the fur line of the hat. A nice top coat seals the design and smooths it out. There you have it... Cute little critters!